I’ve written about MyVegas Rewards in the past but we used them a bit differently this past trip. On other trips we always used the rewards for free hotel stays (not quite free because the hotels charge a resort fee that is not comped). However, this time we stayed with friends at their Elara timeshare (a Hilton property) and so we used MyVegas comps for fun things to do. If you are not familiar with MyVegas comps, it’s a free gambling game played on a mobile device or computer via Facebook. I play on the computer, which I heard is faster to accumulate loyalty points. The first two weeks I played the game I was excited to win points but it soon got old. Now I play my daily spin until I collect about 500,000 chips and then I blow it out on MyVegas slot machines as fast as I can to accumulate loyalty points spending as little time as possible. I was pretty impressed with the variety of aquatic life, particularly the large sharks, at Shark Reef in Mandalay Bay. The setting is fantastic with lots of “old ruins” and a sunken ship as the artificial reefs. We spent about 45-minutes looking around but someone could easily spend more time there reading all the information at each exhibit. I don’t think it was worth $20 but it was definitely worth the MyVegas reward points for a fun and educational activity. This is a great point value! Sage in Aria is a very classy restaurant and bar and the Absinthe Experience is very unique. The bar tender poured a shot of Butterfly absinthe (from Switzerland) into our glasses, placed a sugar cube on a fancy slotted spoon over the top of the glass, and then set up an antique-looking water fountain that slowly drips spring water into each glass. As we sipped our drinks, our bartender answered our questions about the process and history of absinthe. The more we expressed our interest, he opened up about his knowledge. 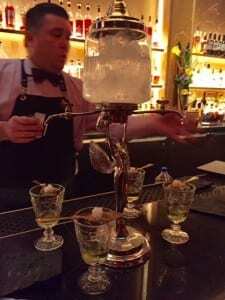 To me, knowing about the history and why absinthe is presented in this way, is half of the enjoyment of the experience. However, I’m sure there are some MyVegas customers who just come in hoping for a quick shot, slam it down and leave. We tipped him generously. Alibi is located in the middle of the casino but it’s long drapes surrounding the bar and lounge, make it a classy, intimate atmosphere. Only the drinks $20 and under are part of the MyVegas reward. Of course, the one I wanted was $21 so it didn’t qualify. We had a great waitress who told us what she felt were the best signature cocktails, however, they didn’t quite match her description. In fact, my husband got a standard pisco sour and I got a recommended signature cocktail and we couldn’t tell which was which. Neither of them tasted like a pisco sour. I could have been very disappointed if I paid money for the drinks but as a MyVegas reward, it was ok. Playing MyVegas is Mindless but Enjoying Free Stuff is FUN! Remember, this site is about cheap tricks to travel, so for people looking for FREE things to do or places to eat and drink, spending time earning MyVegas loyalty points is worth it. I collect my chips once a day and when I have built up about 500,000 chips over several weeks, I leave a browser open to MyVegas, set the slot game to 50 spins and just let it spin and win while I’m not even paying attention to it. Next Cheap Points for the New Le Meridien Rome!